Tuna from the sea in California rolls. 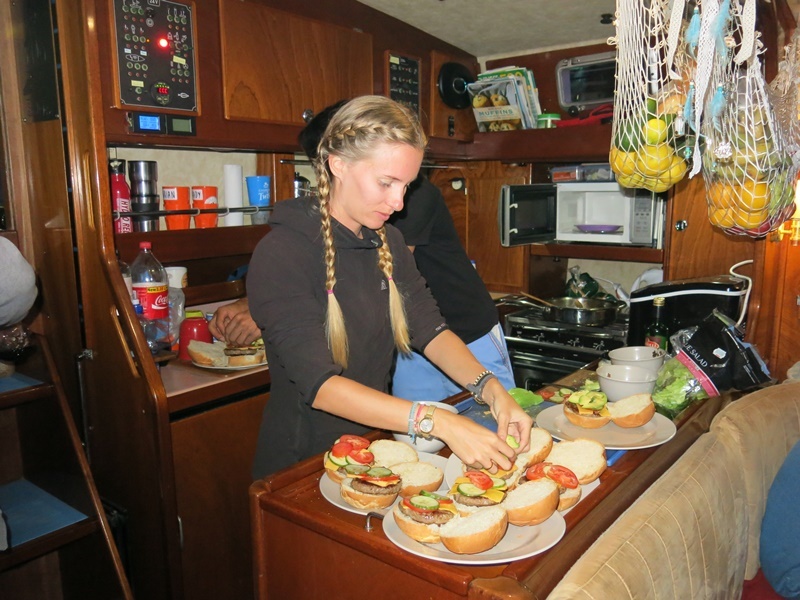 Many people envision the cuisine on a boat as not much more than eating cold baked beans out of the can and rationing out water and mouldy pieces of bread. Not on Delos! The galley is fully kitted out with a gas stove, microwave, ice machine, fridge, freezer, bread maker, soda stream and all the cooking utensils you would need to make almost any meal, as well as a huge amount of storage space. We also have two stills on board, to make alcohol, and a water maker that can pump out approximately 200 litres of water an hour. We have two special diets on Delos, Karin who is intensely lactose intolerant, and I am unashamedly a bunny-hugging vegetarian (although I am open to the idea of eating fresh fish, killed and caught as humanely as possible by the crew). It has been surprisingly easy, so far, to cater to the both of us and I really appreciate the crew’s efforts in making me delicious veggie alternatives. The four boys, on the other hand, eat pretty much everything and anything, including all my leftovers. Each crew member has their own day to take charge of the galley and for that day you are responsible for lunch, dinner, as well as all the dishes. It may sound like a lot for one day, but it is quite enjoyable and for the next five days you can park off and get fed by the other crew members as you have time to contemplate the next feast you will cook up. We have a real big mix of personalities on board and that in turn makes for some interesting and different meals, each person having their own flair and flavour palette. Brady likes to make “mix ups” or “mash ups”, where he pretty much puts a huge variety of ingredients into a stew, soup or pie. His other specialty is Mexican food. Dillon is the pasta king and takes huge pride in his perfect al dente pasta. Karin likes to add the word “Swedish” as a description to her every meal; whether it is a “Swedish Tex Mex”, “Swedish Pizza” or “Swedish Chocolate Cake”, her flavour balance is perfect and always makes me feel right at home. Brian likes to cook greasy and meaty but is always kind enough to provide me with a delicious veggie option. Kiril underestimates his cooking, always fretting about what he is going to make on his day, but he has a great style in the kitchen and is one of the best choppers I have ever seen. I am more inclined to cook spicy curries (although I have had to tone them down a bit for the sake of the crew), I am from Durban after all. Variety really is the spice of life! Living on the ocean can really build up an appetite and I find myself constantly day dreaming about food. I am hoping I don’t put on too much weight during my time aboard, as we truly eat like kings. Some of the amazing meals we have had on Delos during our time in South Africa (each meal is lactose-free and vegetarian or had a veggie alternative for me): vegan vindaloo, veggie/chicken stir fry, “spag bol”, salad, roasted vegetables and roast chicken, burritos, pancakes, coconut cream curry, banana bread, couscous salad, quinoa salad, French toast and lasagna. The first three weeks eating on Delos was mostly at marinas with only four days cooking out at sea. 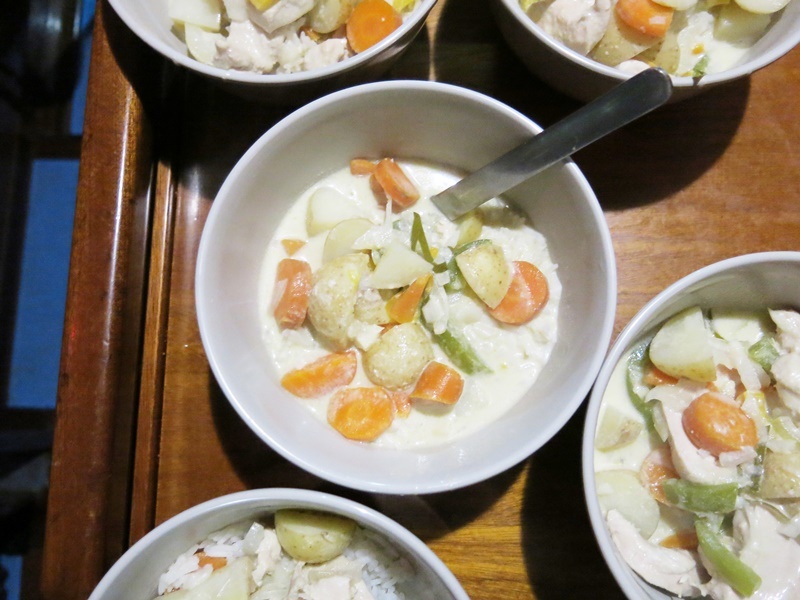 After the 15-day passage from SA to Reunion, I have decided to write a bit about how our meals changed while out at sea. Firstly, I was horribly sea sick for almost half the passage, which made keeping my food in my stomach very difficult. Nothing really appealed to my appetite and my cooking day was quite tough on me. Secondly, the ocean was really rough for most of the passage, with only a few calm days. Cooking while the boat was surfing down huge swells and beating into 40 knots of wind was not easy, you had to strap yourself into the galley so you wouldn’t fall and break your face. Prep had to be done carefully, chopped veg had to be put into containers on grip pads so you didn’t have pieces of carrots and cucumber flying around the galley. Hot oil was a bit hazardous and frying was to be avoided, hot water for tea and coffee could also prove to be a little dangerous if you weren’t careful. Bread ran out by the third day so go-to easy sandwich lunches were done with and had to be replaced with meals like two-minute noodles, wraps and pancakes. Anything really goes out at sea! The vegetables were all refrigerated and lasted surprisingly well. We still had edible tomatoes, potatoes, onions, butternut, oranges, apples and even a cucumber that survived two weeks. 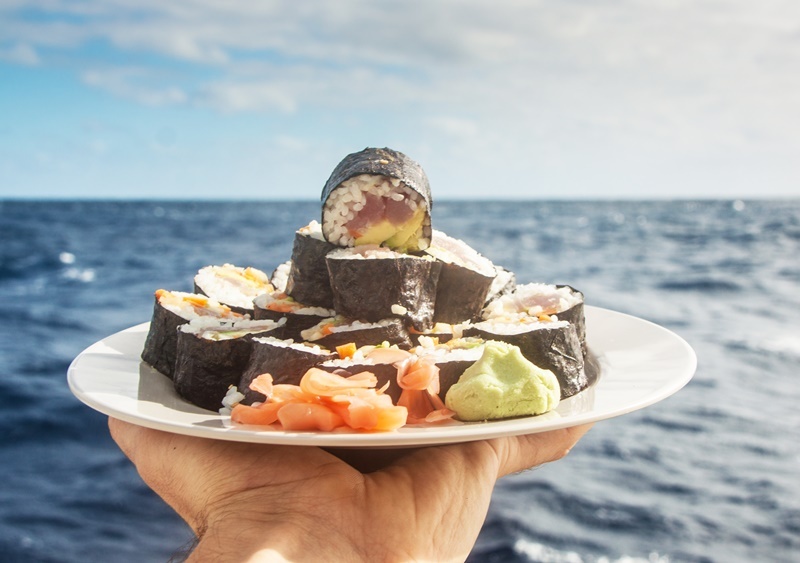 I think everyone’s favourite meals of the voyage were those provided by a beautiful tuna that we caught on our 11th day out at sea, and ate for three days. All in all, the meals were simpler, we ate lots of one-pot meals, as they are obviously easier to make than complex dishes with loads of different textures and tastes. But the crew really impressed me, everyone still put so much effort into making great meals even if they weren’t feeling so great themselves. No matter where or how I travel, food is always something to indulge in, enjoy with good company and will ultimately bring back memories when you eat similar meals in the future. 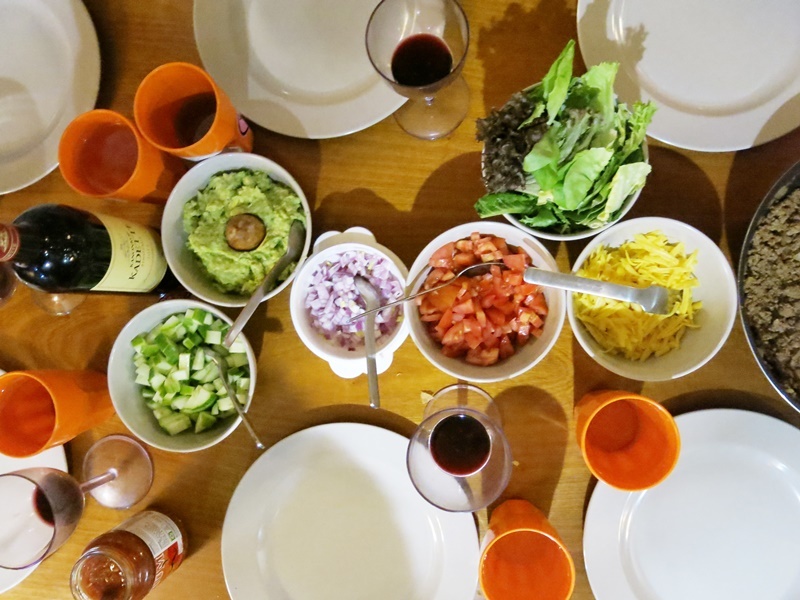 Cheers for all the tasty meals and great conversations around the dinner table Delos! I hope to dine with you again one day!